In 2018, adults will still dedicate more time per day to TVâ€”nearly 3 hours, 50 minutesâ€”than to any other medium, but TV time is shrinking, down from 4 hours, 37 minutes in 2012. 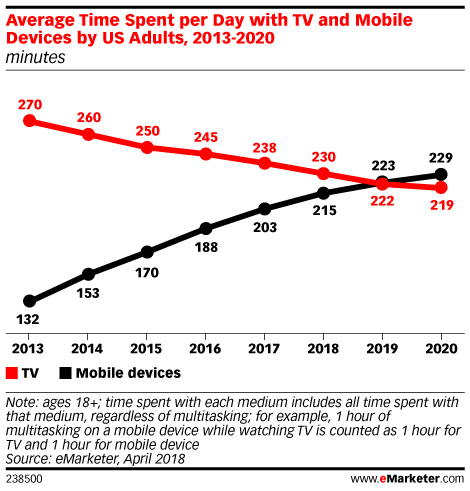 Mobile time will increase to 3 hours, 35 minutes in 2018, and by 2019 mobile will be the new leader in time spent, with 3 hours, 43 minutes of engagement vs. TVâ€™s 3 hours, 42 minutes. Thatâ€™s according to eMarketerâ€™s latest forecast on mobile media time spent. Time spent on mobile, however, is likely approaching a peak, and within a few years, we believe weâ€™ll start to see it plateau. Several trends on the horizon could put a stop to mobile time's seemingly inexorable rise. A slew of newer device categories, such as smart speakers, smart cars, wearables and VR headsets, might dent time spent. At the same time, there is a growing backlash against the overconnected lifestyle. We are already seeing a decline in time spent with tablets, which reached an inflection point in 2016, when US adults averaged 70 minutes using them. That average has since dipped about a minute to 68.7, and this gentle downward trend is set to continue for the next few years. Just as bigger and better smartphones decreased tablet minutes, newer devices, such as smart speakers, may replace smartphones for some tasks. We estimate that more than a third of millennials will use a smart speaker at least monthly in 2018, as will roughly a quarter of Gen Xers. That isnâ€™t to say the importance of mobile devices will diminish. They will sit at the center of all of these devices and connect with them. But future consumers will have a more varied set of digital interfaces. Copyright 2018 eMarketer Inc. All rights reserved. From https://emarketer.com.